The cost of medical care can be staggering for most individuals, regardless of income. Whether expenses arise from an auto or home accident or relate to a chronic or long-term illness, out-of-pocket costs can climb into the thousands of dollars and threaten a household's financial solvency. The Internal Revenue Service allows individuals to deduct qualifying medical expenses that are not covered or reimbursed by their health insurance company. However, there are certain rules taxpayers must follow and thresholds they must meet in order to qualify for the write-off. First, individuals must itemize their deductions in order to take the medical expense write-off. In addition, the IRS has imposed new qualifying thresholds. For taxpayers who plan to itemize expenses for the 2012 tax year (which will be filed in 2013), qualifying expenses must exceed 7.5 percent of their adjusted gross income. However, this benchmark will increase to 10 percent when individuals go to file their taxes for the 2013 tax year. Therefore, it's important to keep all receipts, invoices and other documentation and add up the costs to ensure that this threshold is met. Understanding which types of expenses are considered "qualifying"
Not all medical costs may be included in the deduction, so it's important know which ones are allowable. There are a wide range of costs that may covered under the expense deduction, which include but are not limited to: insurance premiums, medical fees, eyewear, artificial limbs and prosthetics, hearing aids, prescriptions, psychiatric care, special education and even stop-smoking programs. In addition, individuals may deduct these costs for themselves, spouses and dependents. 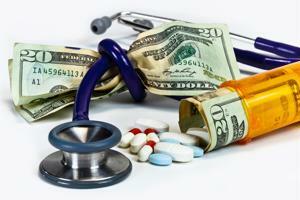 There are also several associated costs that many people overlook which are deductible. For instance, taxpayers can write off travel expenses to and from medical treatments, uninsured medical treatments, medical necessary costs prescribed by a physician and certain medical conference costs. However, some expenses that correlate with a person's health and wellbeing are not necessarily included in this rule, such as gym memberships, cosmetic surgery, funeral expenses, nonprescription drugs and nutritional supplements. Because the list of qualifying expenses is quite extensive, it can be helpful for individuals to consult a tax preparer if they plan to deduct health-related costs. While many people may not think to include their tax preparer when they are undergoing a chronic illness, doing so can help them understand the steps they need to take to secure the deduction and organize their documents.